Tranquilizing, anti-convulsive, spasm suppressing, soothing and blood circulation promoting properties to deal with headache, migraine. 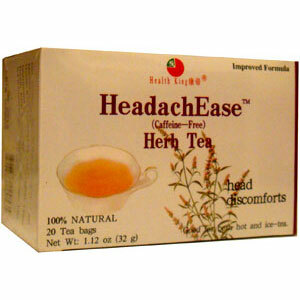 Based on a proven ancient formula, HeadachEase Herb Tea is made of high quality herbs. Chinese medicine uses their tranquilizing, anti-convulsive, spasm suppressing, soothing and blood circulation promoting properties to deal with headache, migraine, etc. It has special effects on headache caused by improper air conditioning.